All of The Classic Barn Company’s oak garages are crafted from high quality oak selected specifically for its purpose. A very strong and reliable timber used over many centuries that now takes pride of place within the detailed frames that we have created. We offer a large selection of traditional oak garages for our clients, including our unique Extrawide™ range that provides exceptional width across each bay. All of these beautiful frames are carefully crafted in our designated saw mill. With our head office based in the heart of Hampshire and our secondary office in Sussex we are within easy reach of the local surrounding counties throughout these regions of the UK. Our flexible professional service can manage the entire project from planning right through to completion, with a decade of expertise upholding our product development and service you can trust that our buildings will make a valued investment towards the enhancement of your property. Accredited to the Guild of Master Craftsmen our oak garages have a reputation locally for being the most generously detailed frames in the market place. Our team will demonstrate how we achieve this. When you contact us our consultant will discuss your ideas and the entire range of options available to you. Get in touch and share your thoughts, come meet the team and even visit our work where previous clients can share their experiences with you regarding our incomparable standards. 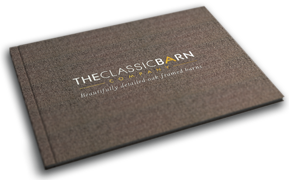 part-owned by The Classic Barn Company directors.